North Korea volcano: Seismologists study whether Mount Paektu could erupt again. 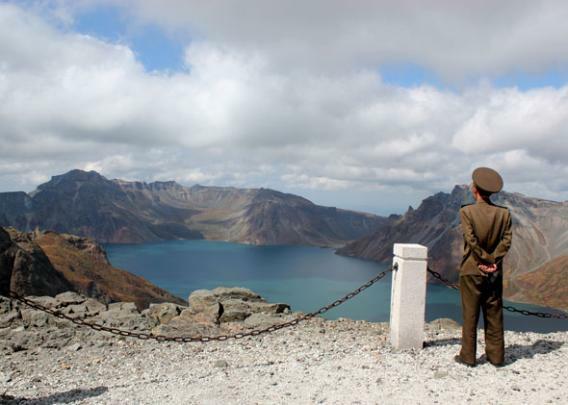 A soldier on Mount Paektu, North Korea, overlooking Lake Chon. James Hammond is a seismologist at Imperial College London. He and Clive Oppenheimer are working in North Korea to study the Mount Paektu volcano on the border with China. Catherine Brahic: Tell us what you are doing in North Korea. James Hammond: I’m part of a joint project with North Korean scientists to understand the Mount Paektu volcano, on the border of North Korea and China. Its last eruption 1,000 years ago was one of the largest in human history. The whole top of the volcano blew off. There are still tens of meters of rock and ash deposits. In the early 2000s, it showed signs of life—an increase in earthquakes was recorded and some signs of inflation. CB: You mean the volcano’s sides were bulging? JH: Exactly. These were signs it wasn’t as dormant as we thought. That piqued everyone’s interest. With its history, it’s quite a worrying volcano. CB: What do we know about the last eruption? JH: The exact size of the last eruption is not well-characterized. Chinese scientists have worked on it a lot in the last 15 years, but before that there were only a few studies. The only eruption we can compare it to is Mount Tambora in Indonesia in 1815, after which the world had a year without summer. It looks like Mount Paektu didn’t have a similar effect, but we don’t know why. These are the big questions that we hope to understand. CB: How did you get involved? CB: How quickly did the project come together? JH: We had about two weeks’ notice, then we went out there. We flew up to the volcano with about 30 North Korean scientists, who took us on a tour of their seismic observatories. Then we had two days of discussions. By the end, it was clear that we had common goals. CB: What are some of those goals? JH: A big aim is to use seismology to look inside the volcano, a bit like a doctor would do with a CT scan. To do that well, you need to look from all sides. This is a chance to get North Korean data to add to the Chinese results and form a more complete picture of what’s driving the volcano. We deployed six seismometers in August, and they’re all recording now. We’ll collect the full data set by August next year. JH: In 2011, we were told we were the first Western scientists to visit their volcano observatories, which was quite special. It’s clear that the North Koreans have been working on this volcano for years. We hope to help them bring that work to the international community. CB: What is your impression of their science? JH: It’s clear there’s a high level of understanding. Obviously some things are difficult for them—like access to recent papers. But, on the whole, I am impressed by their expertise.